Prepare and interpret financial statements in comparative and common-size form. Compute and interpret financial ratios that would be most useful to a common stock holder. Compute and interpret financial ratios that would be most useful to long -term creditors. Comparison of two or more year’s financial data is known as horizontal analysis, or trend analysis. Horizontal analysis is facilitated by showing changes between years in both dollar and percentage form. Click here to read full article. 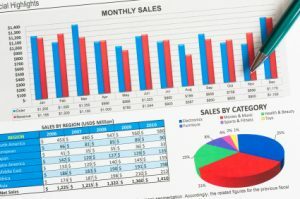 Horizontal analysis of financial statements can also be carried out by computing trend percentages. Trend percentage states several years’ financial data in terms of a base year. The base year equals 100%, with all other years stated in some percentage of this base. Click here to read full article. Vertical analysis is the procedure of preparing and presenting common size statements. Common size statement is one that shows the items appearing on it in percentage form as well as in dollar form. Each item is stated as a percentage of some total of which that item is a part. Key financial changes and trends can be highlighted by the use of common size statements. Click here to read full article. Liquidity ratios measure the short term solvency of financial position of a firm. These ratios are calculated to comment upon the short term paying capacity of a concern or the firm’s ability to meet its current obligations. Following are the most important liquidity ratios. Long term solvency or leverage ratios convey a firm’s ability to meet the interest costs and payment schedules of its long term obligations. Following are some of the most important long term solvency or leverage ratios. A collection of financial ratios formulas which can help you calculate financial ratios in a given problem. Click here. Although financial statement analysis is highly useful tool, it has two limitations. These two limitations involve the comparability of financial data between companies and the need to look beyond ratios. Click here to read full article. There are various advantages of financial statements analysis. The major benefit is that the investors get enough idea to decide about the investments of their funds in the specific company. Secondly, regulatory authorities like International Accounting Standards Board can ensure whether the company is following accounting standards or not. Thirdly, financial statements analysis can help the government agencies to analyze the taxation due to the company. Moreover, company can analyze its own performance over the period of time through financial statements analysis. What is the role and purpose of accounting inthe whole management field.